Put off by the idea of giving the kids in your life a pack of toys they'll only grow tired of by the time the new year hits? Then give them books—lots and lots of books. Here we get your list started with our picks for the brightest, most beautiful offerings of the season, for children of all ages. Happy reading! Color Dog by Matthew Van Fleet & Brian Stanton. Finally, someone’s put adorable, freeloading puppies to work—helping tots learn their colors. This thick, colorful photo book has big, toddler-friendly tabs for puling to make tails wag and heads bobble, and foldouts galore, behind which a host of irritated cats would prefer to remain inconspicuous (ages 2+, $20). Tough Guys Have Feelings Too by Keith Negley. Possibly the best gift of all for the sensitive kid on your list is the gift of self-confidence. The slim volume, enriched with vivid color block illustrations, shows the toughest of men feeling sad, uncertain, and lonely and is certain reassurance that our feelings only make us more lovable (ages 3-5, $18). Classic Children’s Tales: 150 Years of Frederick Warne. The British children’s publisher Frederick Warne brought you, and your parents, and your parents’ parents, some of their favorite stories of all time, Beatrix Potter’s The Sly Old Cat not least among them. This compendium of six of their most famous offerings presents, too, their original, charming illustrations, along with introductions by contemporary children’s book authors and illustrators. A perfect read-aloud for the end of a holiday—or any—evening (ages 3-7, $25). Robo-Sauce by Adam Rubin & Daniel Salmieri. This seriously ingenious little book within a book will have your kids manipulating its pages over and over to work its transformative trick. All the while, they’ll be reading a hilarious take on what happens when robots take over the world, and wishing upon any star that it will come true (ages 4-8, $19). Oskar and the Eight Blessings by Richard Simon, Tanya Sin & Mark Siegel. In December of 1938, Christmas and the seventh night of Hanukkah converged, creating a super-charged atmosphere of love and giving for a boy who had already lost so much in his young life. New York City-dwelling kids especially will relish the opportunity to compare their city, then and now and to reflect on all the ways that we are the same (ages 4-8, $18). Written and Drawn by Henrietta by Liniers. hint, hint... (ages 5+, $13). 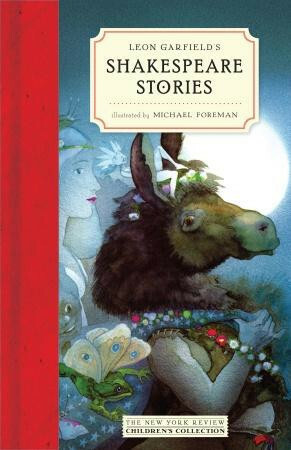 Shakespeare Stories by Leon Garfield & Michael Foreman. There’s a classicist in almost every family, and this terrific rendering of the Bard’s plays in story form brings 21 tales to light for a young, traditionalist audience that might otherwise be frustrated with language that can be a challenge at times, even for grownups. A far cry from a child’s version of Cliff’s Notes, the author weaves Shakespeare’s own words and tone into the fabric of his renderings, with familiar, and yet fresh, results. In fact, you might want to add it to your own bedside stack of must-reads (ages 5+, $25). The Day the Crayons Came Home by Drew Daywalt & Oliver Jeffers. While kids are unwrapping new toys and games galore, this book is a not-so-gentle but still sweet reminder for them to think fondly on all the possessions they once loved and cherished—before they carelessly discard a whole new season's worth (ages 5-8, $19). kid you know (ages 8+, $17). Historium by Jo Nelson & Richard Wilkinson. The internet may have rendered encyclopedias obsolete, but this amazing large-format illustrated series—the first was Animalium—is single-handedly showing kids of all ages the joys of knowing a little about a lot of strange and interconnected things. Got a kid who dreams of becoming an archaeologist? Then this book is the ultimate brain- and eye-candy for her (ages 8-12, $35). The Wolf Wilder by Katherine Rundell. A middle grade fairy tale that unfolds over a wild, snowy expanse of Russian wilderness as a young wolf rehabilitator named Feo struggles to save everything that she loves. This is the perfect story for curling up to on a cold winter's night, and for dreaming of all that is possible in this world—and others (ages 8-12, $17). The Doldrums by Nicholas Gannon. For the tween reader who loves a rousing adventure—and is still pleased to have accompanying illustrations to bolster the scenes he’s imagined in his mind. This book will add just a bit more magic to the holidays (ages 8-12, $18). Roller Girl by Victoria Jamieson. Graphic novels have become a popular means for conveying tales of tween drama, and this illustrated story about best friends drifting apart to find their own new and true selves is an apt example of how powerful the genre can be. Even if your own kid shakes her head at the notion of roller derby, Roller Girl will get her thinking about her own unique abilities (ages 8-12, $13). The Toymaker’s Apprentice by Sherri L. Smith. For the ballet-obsessed on your list, this story is a retelling of E.T.A. Hoffman’s fairytale “The Nutcracker and the Mouse King,” itself the inspiration for perennial season favorite performance, The Nutcracker. Only here, readers will be forced to contemplate the possibility of a strange, alternate fate: mice and squirrels taking over the world (ages 10+, $17). Alice’s Adventures in Wonderland by Lewis Carroll with new illustrations by Anna Bond. Truth be told, text and illustrations go in and out of style. And 150 years after Lewis Carroll released his Alice, the classic story gets a fresh, modern, and most welcome update from illustrator Anna Bond, who also manages to give the protagonist and all her cohorts a sweetly innocent mien (ages 10+, $30). Saint Anything by Sarah Dessen. If the holidays are about anything, they’re about family—the one we’re born to and sometimes, the more nurturing one we find in its stead. A wrenching, honest tale for teens who are prescient enough to understand that life’s miracles can be subtle and often, must be worked for rather than waited for (ages 12-17, $20). and friends—actually for kids? Or is it really for their grownups, who grew up admiring and aspiring to the reckless hi-jinx of Manhattan’s unruliest citizen? Likely it will fit the gift-giving bill for quite a number of folks on your list. Because Eloise, it seems, simply never goes out of style—and that's just the way we like it (all ages, $20). Did You Actually Lick the Tire?